Maxillofacial injuries in general can occur in isolation, but most of the time when these injuries are as a result of high energy traumatic forces, patients often have other concomitant injuries. These injuries can be very severe and life-threatening often requiring multidisciplinary management. An attempt is made in this present study to determine the pattern of injuries associated with trauma to the midface in an effort to emphasize the multidisciplinary nature of the care needed by many of these patients. This was a prospective descriptive analysis of patients with midfacial injuries seen at our center over a period of 1 year. The study was approved by the Health Research Ethics Committee. We defined the midface as the area that lies between the lateral canthus of the eye superiorly and the angle of the mouth inferiorly, which on the facial skeleton extends downwards from the frontal bone to the level of the upper teeth or, if the patient is edentulous, the upper alveolus. Midfacial injuries were categorized into soft and hard tissue injuries after clinical and radiographic examinations. For each of the 101 patients seen, the following data were collected: Age, gender, mechanism of trauma, type of midfacial injuries and concomitant/associated injuries. Concomitant injuries were categorized into fractures other than those of the midface, head/neurological, orbital, thoracic and abdominal injuries. Out of the 150 patients that presented to our center with maxillofacial injuries during the period of this study, 101 had midfacial injuries. Eighty five (84.2%) were males and 16 (15.8%) were females. 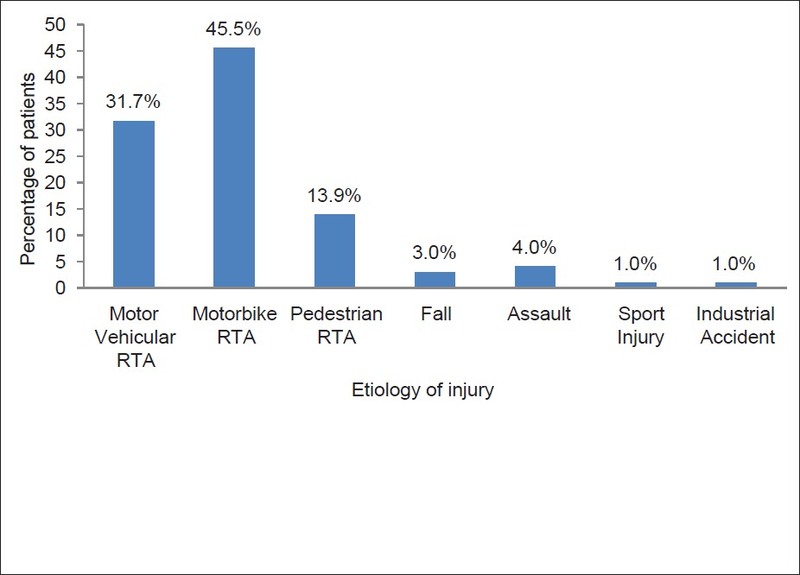 The 20-29 year age group were mostly affected (44.6%), followed by the 30-39 years group (19.8%) [Figure 1] and the most common cause of midface injuries was road traffic accident (RTA) (92 patients, 91.1%) [Figure 2]. 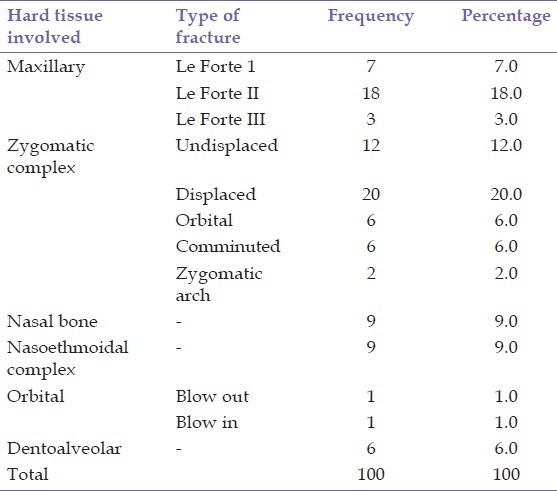 Abrasion was the most common midfacial soft-tissue injury seen; accounting for 81 (40.1%) out of a total of 202 soft tissue injuries [Table 1], whereas zygomatic complex fracture was the most common hard tissue injury, accounting for 46 (46.0%) fractures among the 100 fractures of the middle-third facial region recorded [Table 2]. A total of 144 concomitant injuries were recorded among the patients. 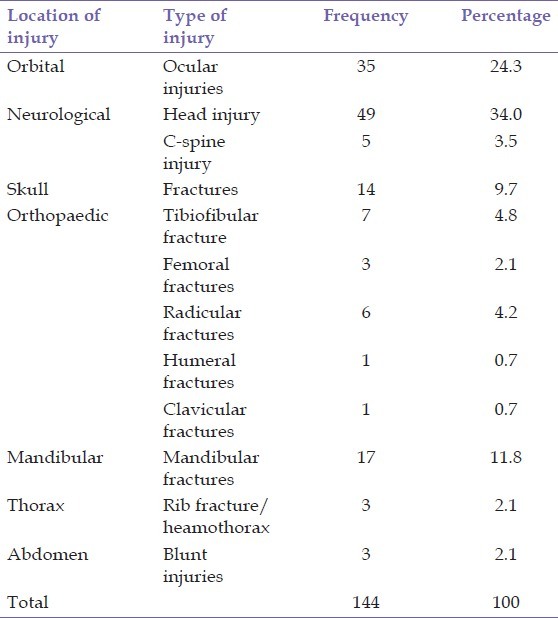 Out of these, head injury was highest (49; 34%) followed by ocular injuries (35; 24.3%) [Table 3]. The main stay of treatment for midfacial fractures from the above study was conservative management and closed reduction with maxillomandibular fixation. Moreover, it has also been documented by Lee et al. in a study on patterns of facial laceration from blunt injury that as the zygoma would fracture more readily than the frontal bone, the soft-tissue overlying the zygoma would therefore suffer a smaller magnitude of force resulting in contusions rather than open wounds. This could possibly explain the results obtained from the present study in which the soft-tissue overlying the zygoma was more affected by contusions and abrasions instead of lacerations [Table 1]. Upper lip on the other hand was the most common site for open wounds or lacerations as has been previously documented. , This is due to the fact that the upper incisors act as sharp objects in cases of injuries to the face, sometimes giving a through and through laceration of the upper lip. Maxillofacial injuries in general may occur in isolation or can be associated with other injuries  and the same is the case for midfacial injuries. Fasola et al. 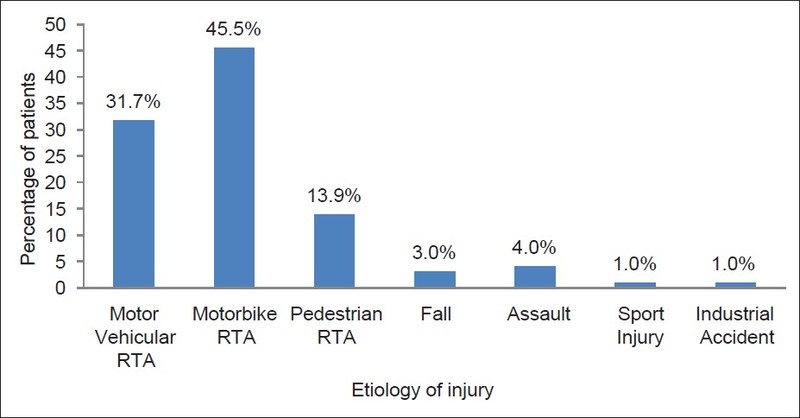 reported 79.6% of associated injuries in their study population and the authors argued that such a high figure was expected because of RTA being the major etiological factor. 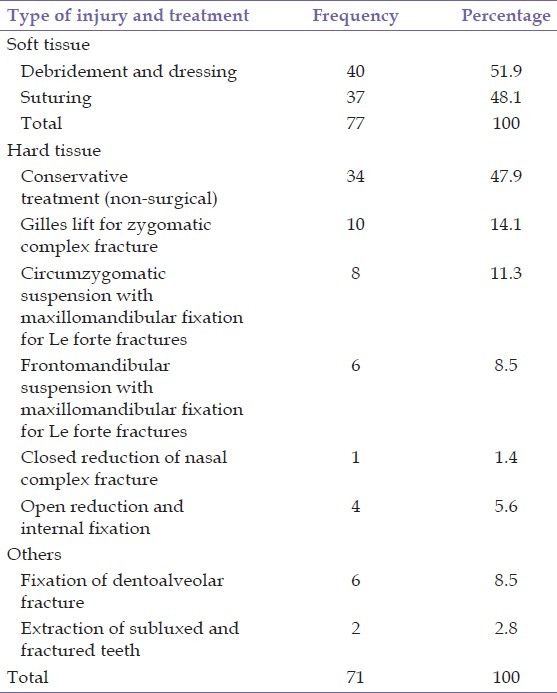 Though there is ambiguity about the definition of injuries associated with maxillofacial fractures, the rate of injuries associated with maxillofacial trauma is thought to be quite high, ,, the present study also recorded a rate as high as 83.2% of associated injuries. These associated injuries are reportedly more common when maxillofacial fractures occur from road crashes and high velocity gunshot injuries resulting in multiple organs and systems involvement. , In fact, Haug et al. was able to show from their series that motorcycle accidents were associated with the most severe head injury. However, this present study concentrated on concomitant injuries associated with midface injuries. Neurological injuries were the commonest occurring concomitant injuries in this study accounting for 47.2% followed by ocular injuries with 24.3%, [Table 3]. The proximity of the midface to the eyes and the content of the cranium could as well have accounted for this. Hogg et al. also reported head injuries to have accounted for 87% of the associated injuries in their study in Ontorio, Canada, whereas Obuekwe and Etetafia  reported 55.8% of head injuries in Benin City, Nigeria. This wide range is probably due to different selection criteria and methods of detecting brain injury. Recognizing concomitant injuries in patients with facial fracture is important for rapid assessment and further management of these patients. Our study found that cerebral and orbital injuries are often associated with midfacial fractures. Knowledge of injuries associated with maxillofacial fractures and coordination of trauma teams, is vital for the early stabilization and treatment of these patients. Irrespective of the severity of injury, patients who sustained maxillofacial injury were more likely to be discharged earlier than those with concomitant injuries. The presence of moderate to severe head injury, chest injury and orthopedic injury significantly prolong hospital stay. The usage of protective elements by road users especially motorcycle riders and their passengers should be enforced to reduce the rate of head injury and indeed other associated injuries among trauma patients in general. 1. Paludetti G, Almadori G, Corina L, Parrilla C, Rigante M, Ottaviani F. Midfacial fractures: Our experience. Acta Otorhinolaryngol Ital 2003;23:265-73. 2. Roy SK, Suresh PM. Etiology and management of zygomaticomaxillary complex fractures in the armed forces. Med J Armed Forces India 2005;61:238-40. 3. Alvi A, Doherty T, Lewen G. Facial fractures and concomitant injuries in trauma patients. Laryngoscope 2003;113:102-6. 4. Ugboko VI, Odusanya SA, Fagade OO. Maxillofacial fractures in a semi-urban Nigerian teaching hospital. A review of 442 cases. Int J Oral Maxillofac Surg 1998;27:286-9. 5. Oji C. Jaw fractures in Enugu, Nigeria, 1985-95. Br J Oral Maxillofac Surg 1999;37:106-9. 6. Fasola AO, Obiechina AE, Arotiba JT. An audit of midfacial fractures in Ibadan, Nigeria. Afr J Med Med Sci 2001;30:183-6. 7. Fasola AO, Nyako EA, Obiechina AE, Arotiba JT. Trends in the characteristics of maxillofacial fractures in Nigeria. J Oral Maxillofac Surg 2003;61:1140-3. 8. Adebayo ET, Ajike OS, Adekeye EO. Analysis of the pattern of maxillofacial fractures in Kaduna, Nigeria. Br J Oral Maxillofac Surg 2003;41:396-400. 9. Oginni FO, Ugboko VI, Ogundipe O, Adegbehingbe BO. Motorcycle-related maxillofacial injuries among Nigerian intracity road users. J Oral Maxillofac Surg 2006;64:56-62. 10. Malara P, Malara B, Drugacz J. Characteristics of maxillofacial injuries resulting from road traffic accidents - A 5 year review of the case records from department of maxillofacial surgery in Katowice, Poland. Head Face Med 2006;2:27. 11. Brown RD, Cowpe JG. Patterns of maxillofacial trauma in two different cultures. A comparison between Riyadh and Tayside. J R Coll Surg Edinb 1985;30:299-302. 12. Khan AA. A retrospective study of injuries to the maxillofacial skeleton in Harare, Zimbabwe. Br J Oral Maxillofac Surg 1988;26:435-9. 13. Magenis P, Shepherd J, Brown A. Trends in facial injuries: Increasing violence more than compensate for decreasing road trauma. Br Med J 1998;316:325-32. 14. van Beek GJ, Merkx CA. Changes in the pattern of fractures of the maxillofacial skeleton. Int J Oral Maxillofac Surg 1999;28:424-8. 15. King RE, Scianna JM, Petruzzelli GJ. Mandible fracture patterns: A suburban trauma center experience. Am J Otolaryngol 2004;25:301-7. 16. Ansari MH. Maxillofacial fractures in Hamedan province, Iran: A retrospective study (1987-2001). J Craniomaxillofac Surg 2004;32:28-34. 17. Adeyemo WL, Ladeinde AL, Ogunlewe MO, James O. Trends and characteristics of oral and maxillofacial injuries in Nigeria: A review of the literature. Head Face Med 2005;1:7. 18. Gassner R, Tuli T, Hächl O, Rudisch A, Ulmer H. Cranio-maxillofacial trauma: A 10 year review of 9,543 cases with 21,067 injuries. J Craniomaxillofac Surg 2003;31:51-61. 19. Bakardjiev A, Pechalova P. Maxillofacial fractures in Southern Bulgaria-A retrospective study of 1706 cases. J Craniomaxillofac Surg 2007;35:147-50. 20. Yoffe T, Shohat I, Shoshani Y, Taicher S. Etiology of maxillofacial trauma - A 10-year survey at the Chaim Sheba Medical Center, Tel-Hashomer. Harefuah 2008;147:192-6, 280. 21. Ugboko V, Udoye C, Ndukwe K, Amole A, Aregbesola S. Zygomatic complex fractures in a suburban Nigerian population. Dent Traumatol 2005;21:70-5. 22. Dibaie A, Raissain S, Ghafarzadeh S. Evaluation of maxillofacial traumatic injuries of Forensic Medical Centre of Ahwaz, Iran, in 2005. Pak J Med Sci 2009;25:79-82. 23. Lee RH, Gamble WB, Mayer MH, Manson PN. Patterns of facial laceration from blunt trauma. Plast Reconstr Surg 1997;99:1544-54. 24. Ong TK, Dudley M. Craniofacial trauma presenting at an adult accident and emergency department with an emphasis on soft tissue injuries. Injury 1999;30:357-63. 25. Hussaini HM, Rahman NA, Rahman RA, Nor GM, Ai Idrus SM, Ramli R. Maxillofacial trauma with emphasis on soft-tissue injuries in Malaysia. Int J Oral Maxillofac Surg 2007;36:797-801. 26. Haug RH, Savage JD, Likavec MJ, Conforti PJ. A review of 100 closed head injuries associated with facial fractures. J Oral Maxillofac Surg 1992;50:218-22. 27. Obuekwe ON, Etetafia M. Associated injuries in patients with maxillofacial trauma. Analysis of 312 consecutive cases due to road traffic accident. J Med Biomed Res 2004;3:30-6. 28. Hogg NJ, Stewart TC, Armstrong JE, Girotti MJ. Epidemiology of maxillofacial injuries at trauma hospitals in Ontario, Canada, between 1992 and 1997. J Trauma 2000;49:425-32.